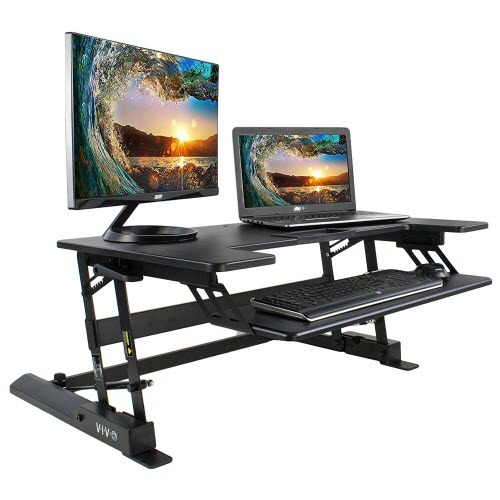 In this article we offer a detailed side-by-side breakdown of the VIVO V000B standing desk converter vs. the VARIDESK 49900 height adjustable standing desk converter. ​Many of our readers have a difficult time choosing between the budget-friendly Vivo and the highly-rated Varidesk models, so we have a full breakdown and buyer's guide to help you compare Varidesk vs Vivo and decide which standing desk converter will be best for your use case. To start, take a look at these short (~1 minute) product videos from the manufacturers and read my quick description of each standing desk converter, along with the general manufacturing specs of each product. Later in this article I'll provide an in-depth, side-by-side breakdown of every aspect that will impact your satisfaction with your desk converter so you can be sure you're making the right decision. The VIVO Height-adjustable standing desk converter in action. The VIVO Standing Desk Converter is an 'Amazon's Choice' pick in the manual and electric standing desk converter category and it allows you to easily convert your existing desk or workstation into a standing desk when desired. The VARIDESK 4990 Pro Plus 36 Desk Converter in action. 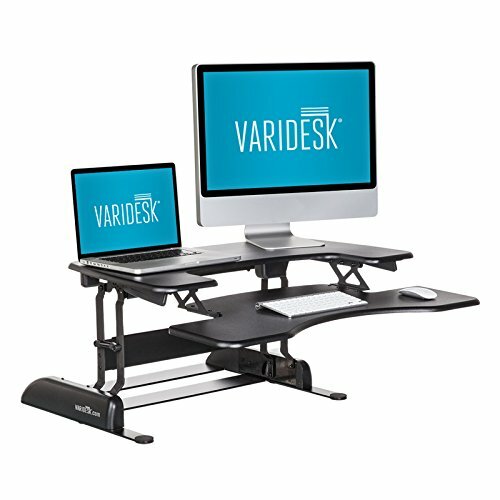 The VARIDESK Pro Plus 36 Desk Converter is one of the highest-rated manual and electric standing desk converters available online. It is also one of the highest priced. Does the Brand of Your Height-Adjustable Desk Converter Matter? One of the key decisions most shoppers face when comparing Vivo vs Varidesk is that the Varidesk model is manufactured by a brand they recognize from television and online ads, whereas VIVO might be an unknown entity. Most shoppers assume that products from well-known brands are lower-risk purchases, and when they see an alternative priced lower from a company they'd never heard of they suspect something may be fishy. Both companies are American and each has an excellent reputation with an A+ rating from the Better Business Bureau (Varidesk's BBB Page, Vivo's BBB Page). I'm of the mindset that the ad dollars a company spends on branding should not influence your buying decision. With that said, I recognize that for most consumers (including me), brand recognition plays an important role in our purchase behavior. In managing this website, I do my best to focus on build quality, design, and attention to detail. I also take time to read and incorporate the lowest customer reviews (instead of the highest) for every product I consider, as I feel this is a true indicator of the risk involved with any purchase. VIVO's DESK-V000B model has the advantage over VARIDESK's 49900 model when it comes to price. It is generally on sale on Amazon and available for about half the cost of the VARIDESK Pro Plus 36. For small business owners looking to purchase multiple standing desk converters, this makes a difference - you could purchase twice the number of the VIVO standing desk workstations for the same cost. With that said, I think the price difference between the two should not be the deciding factor for a single consumer, providing you can afford the Pro Plus 36 from VARIDESK. If you're comfortable investing around $400 in a standing desk converter, my advice would be to buy a full electric desk like the Vortex Series from ApexDesk. It can replace your existing desk entirely and has a quality motor to raise/lower the 60" work-top to your desired height. It only costs about $70 more than the VARIDESK Pro Plus 36 converter and provides more space to spread out when standing at your desk. While some people want a desktop converter instead of a full adjustable-height standing desk, many people don't realize how affordable reliable models like the Vortex Series are. Some excellent crank-adjustable standing desks are even cheaper than the Pro Plus 36 converter. To me the VARIDESK 49900 is not overpriced. It's probably the best standing desktop converter you can buy. So instead of asking whether it's worth the money to buy the VARIDESK instead of the VIVO (it probably is), you may want to ask whether it's worth saving $70 to purchase the best standing desk converter over a really good crank or electric height adjustable desk. At first blush, these desk risers have a very similar design. But there are, in fact, important fundamental differences where the VARIDESK model separates itself as the better-designed standing desk converter. Lets discount for a moment that the Pro Plus 36 from VARIDESK is available in more colors (a nice feature). And lets also set aside that each desk will occupy the same total width (36 inches) on your desk top. The most important design choice for any desktop converter or standing desk is the ability to adjust the height to a proper ergonomic level for your body so that you can work comfortably while sitting or standing and prevent injury. It's clear when you look at the numbers side-by-side like this that the VARIDESK will work better for tall people, and for short people. It also provides more options to dial-in the height to your ideal level for individuals of every height in between. Not only does the VARIDESK Pro Plus 36 look better when flat on your desk (it's a full 2 inches lower profile! ), but it also gives you the ability to raise your desk an extra 1.5 inches with 3 additional total height adjustment options available to users. Furthermore, the VARIDESK provides more complete work-surface coverage on top of your desk. While both desk-risers feature a drop-down keyboard tray (which I wasn't sure I'd like at first, but I do), the VARIDESK keyboard tray extends the full 36 inches of width along the front of the desktop converter (where the VIVO keyboard tray is a cutout along the front of the unit, measuring only 28 inches across). The Pro Plus 36 also features a comfortable center curve which welcomes you to work at the desk. I found that with the VARIDESK the keyboard tray was more comfortable to use and gave me the feeling that the entire desktop was larger when standing, whereas the VIVO keyboard tray made me feel a bit cramped, and will be difficult to use if you use a larger or split ergonomic keyboard. Should You Buy the VIVO 36 Workstation or the VARIDESK Pro Plus 36? In a side-by-side comparison I feel strongly that the VARIDESK Pro Plus 36 comes out as the clear winner in the places that matter most. It is available in more colors, it is easier to raise and lower, it sits lower on your desktop when working in a seated position and offers more height adjustment positions (and raises an additional inch and a half total), making it better for very tall or very short people. So the decision really comes down to price (which you probably already knew). ​Is the VARIDESK Pro Plus 36 worth it? In my opinion, absolutely. ​But the VIVO is a good, budget-friendly VARIDESK alternative that will work well for most people who are looking to save a few dollars.